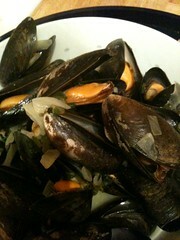 Morston Mussels with Norfolk Apple Juice and Mustard. Wine glass of apple juice – preferably not too sweet. Clean mussels in fresh cold water. 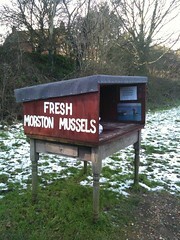 With Morston ones this should just mean pulling the whispy bits (beards) that they cling with and giving a good rinse. Discard any that don’t close. Using a large saucepan, finely chop onion, garlic and parsley and saute in butter until translucent. Add mustard. Turn the heat up high and tip the mussels into the pot along with the apple juice and cream. Cover the pot. The mussels will all open in the next minute or so. While they are doing this, give an occasional stir. Serve in bowls with bread and a spoon to make the most of the luscious juice.